He's got a yellow shirt and a red neckerchief, unruly locks and a sprig of grass in his mouth. He maintains law and order at the Nothing Gulch School, and he runs faster than his shadow as soon as there's even the slightest hint of chores to be done. 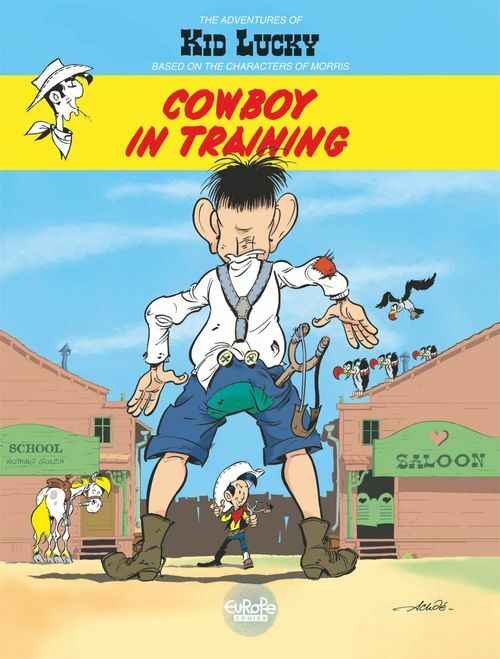 It's Kid Lucky, a young cowboy knee-high to a grasshopper, always ready to discover the customs of the Wild West, and, most of all, to muck about with his buddies. This is the birth of a legend: the greatest (but still quite small) cowboy of the Wild West! In this first album, Kid Lucky learns his very first cowboy lessons.